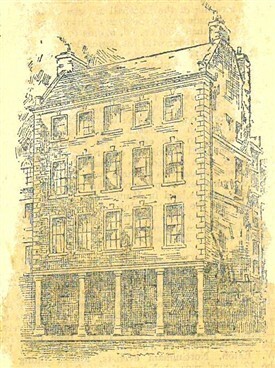 The illustration of the house opposite comes from the Nottingham Daily Guardian of 16th May 1895. 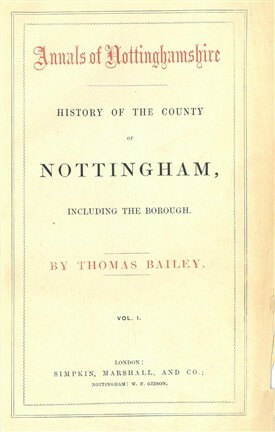 The house was located near Weekday Cross in Nottingham and was the home of Thomas Bailey, author, in 1852, of The Annals of Notttinghamshire (title page illustrated). The house was demolished in the 1890s to make way for (what became) the Great Central Railway as it passed through the city towards its new Victoria Station. Of its design, the Nottingham Daily Guardian noted that, although of Georgiam style, "No trace of a figure to guide one in fixing the exact date of its erection has been discovered, but...... it is probable that it was sometimes the home of important officials of the borough, who may have had duties connected with the Town Hall [which was originally located nearby]. Tthe mantel-pieces were of carved oak and most of the commodious rooms were oaken-panelled". Thomas Bailey was born in Nottingham in 1785 and became a prominent person in the town, becoming proprietor of the Nottingham Mercury newspaper in c.1845. His son, Philip James Bailey, was born in the Weekday Cross house on 22nd April 1816. Aged 23 Philip became the celbrated author of "Festus", a poem that attracted worldwide attention following its publication in 1839.